I know what you are thinking…" duh, Sarah. Starfish aren't blue! They are crumb cake and sahara sand" True, they usually are but did you know that they can also be colored? One of the most amazing incredible sites that I have witnessed are the gorgeous blue starfish in Fuji. Seriously…go ahead and google it. Right there…Dapper Denim starfish, who would have thunk it? I cannot tell you how amazing it was to be snorkeling along and see one of them just resting on the bottom of the ocean. 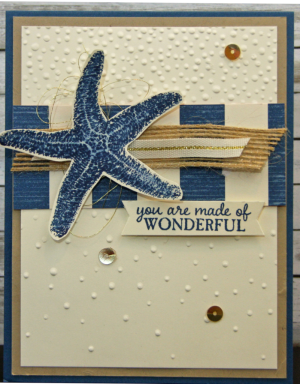 Sites, that are all made possible by the awesome Stampin' Up! incentive trips and my fabulous customers and downline that help in getting me to awesome exotic places. Incentive Trip 2017? Phukat, Thailand…Ella and I are ready for an adventure! This was a Hostess Club card that we did at the beginning of the month. Don't forget that we can include you in the Hostess Club even if you aren't able to attend in person. I send videos and cards for your stamping enjoyment. Yes, we ARE that kind of enablers. Here's the "how-to" video for you. Why don't you think about joining us!